It’s Mother’s Day on Sunday, can you believe it? How are we half way through May already? How will you be celebrating this special day? When I was younger my family and I would often spend Mother’s Day at the arboretum looking at the beautiful spring wild flowers and celebrating our incredible mom. If I were home to celebrate Mother’s Day this year, the first thing I would do is whip up a tasty brunch. 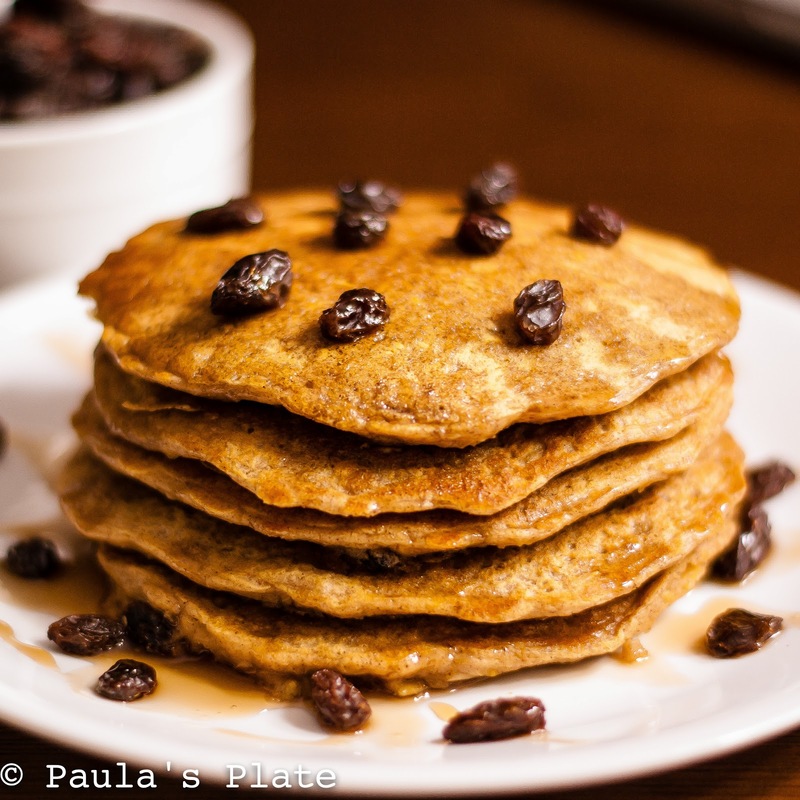 Not just any brunch, however, a brunch filled with these Oatmeal Raisin Cookie Pancakes. Yes. You read that right. What’s particularly great about this recipe, is that you can do much of the prep work the night before, rendering it ideal for a lazy weekend; when you wake up the following morning, breakfast comes together in minutes. In fact, it’s the perfect recipe for breakfast in bed for the number one woman in your life. Spiced with warm cinnamon and filled with oats and raisins, these oatmeal raisin cookie pancakes taste just like they sound – cookies for breakfast? Yes, please! Plus, with the addition of oats, you have a wonderfully filling breakfast that will keep you fueled for a busy day. If you’re looking for a delicious way to spoil your mom this Mother’s Day, look no further than this recipe. It will be sure to please. Happy Mother’s Day to all of you wonderful mothers out there, and especially to you, mom. You are the most generous, loving, supportive, and creative person that I know, and I count my blessings daily that I have you in my life. I love you. How will you be celebrating Mother’s Day this year? Let me know below! In a medium bowl, mix together oats, buttermilk, cinnamon and vanilla. Cover and refrigerate overnight (or at least 8 hours). The next morning, make a well in the center of the flour mixture and add the oatmeal mixture, eggs, melted butter and remaining buttermilk. Stir until just moistened. Allow batter to sit for 20 minutes before cooking. If batter is too thick, add 1 tbls. buttermilk at a time until desired consistency is reached. Heat a griddle to medium heat (350 degrees). Spray lightly with cooking spray and drop by 1/3 cup onto the hot surface. Sprinkle raisins on top of the batter. Cook pancakes until bubbles appear and bottom turns golden brown; flip pancakes, and cook until lightly browned on opposite side. Recipe adapted slightly from Allrecipes. Mother's Day was this Sunday here. It's so odd that the two are two weeks apart. My husband always panics when I call my mom on the American mother's day until I remind him the French one is still two weeks away. I've been obsessed with raisins lately (no idea why) and these look like a wonderful breakfast – or dinner/breakfast. Do you recommend maple syrup with them?